Hi friends, in this article, I am going to describe the importance of free wheeling diode in power electronics. I hope you will find it informative and useful. In motor control circuits, a diode known as the freewheeling diode is connected across motor terminals to allow for dissipation of energy stored in motor inductance and to provide for continuity of motor current when the SCRs are blocked. It also provides protection against transient over voltages. If the inductor is supplied via a mechanical switch, and we open the switch to reduce the current to zero instantaneously, we are trying to destroy the stored energy. This is not possible, and the stored energy in the magnetic field is dissipated in the form of a spark across the contacts of the switch. The appearance of a spark shows that there is a very high voltage which is sufficient to break down the surrounding air. The self-induced voltage in an inductance is proportional to the rate of change of current, so when we open the switch in order to force the current to zero quickly, a very large voltage is induced in the inductance. This voltage appears across the terminals of the switch and if this voltage is high an arc appears and allows the current to continue to flow until the stored magnetic energy is dissipated as heat in the arc. Sparking across a mechanical switch does not cause immediate destruction, but when a switching element (like SCR, IGBT etc.) is used sudden failure is sure unless steps are taken to dissipate the stored energy. This is achieved with the use of a ‘freewheel diode’ (sometimes called a flywheel diode). In silicon controlled rectifier circuits, output load current (or voltage) can be varied by controlling the point in the input AC cycle at which the thyristor is turned ON with the application of a suitable low-power gate pulse. rest of the half-cycle i.e. up to 180o. The firing angle α can be adjusted with the help of the trigger circuit. When an SCR is conducting, it offers no resistance i.e., it acts like a short-circuit. The figure shows an elementary SCR shunt motor speed control circuit, in which SCR triggering is delayed by angle α with the help of a trigger control circuit. 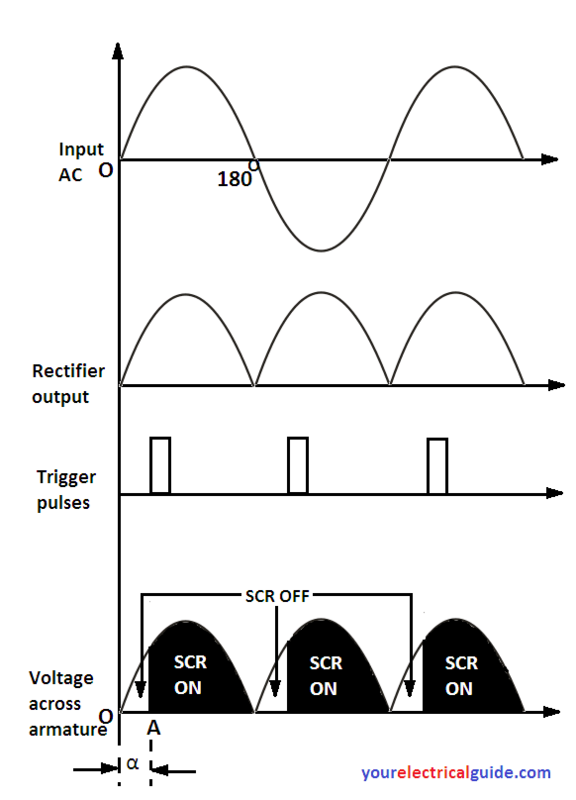 As shown, the SCR starts conducting after a delay of α when a gate pulse is applied and a consequent decrease in output voltage takes place. In the circuit of Figure when the SCR is on, current (I) flows through the load, but not through the diode, which is reverse-biased. When the SCR is turned OFF, the current flow through it drops very quickly to zero. But due to stored energy in the magnetic field of the motor, its current cannot suddenly disappear. So, since there is no longer a path through the SCR, the current diverts into the only other path available and flows upwards through the low-resistance path offered by the diode until the energy stored in the inductance is dissipated as heat. As we know that when a diode conducts, the forward-bias volt-drop across it is small – typically 0.7 V and therefore limits the voltage across the SCR to a safe value and it prevents any dangerously high voltages from appearing across the SCR. In this way a freewheeling diode allows inductive loads to be switched without damage to the SCR. In the electronic circuits, a switching element (SCR, IGBT etc.) switches (turn ON and turn OFF repeatedly) at a predetermined frequency to control the voltage of the load. When the switching element switches to do so, a very high voltage spike due to stored energy in the magnetic field of the inductive load appears across the terminals of the switching element in OFF state. It may destroy the switching element. To dissipate this energy, the freewheeling diode is used. It short circuits the load when the switching element is in OFF state and hence the stored energy in the magnetic field of inductive load is dissipated as heat. Thanks for reading about free wheeling diode in power electronics. © https://yourelectricalguide.com/ free wheeling diode working in power electronics.